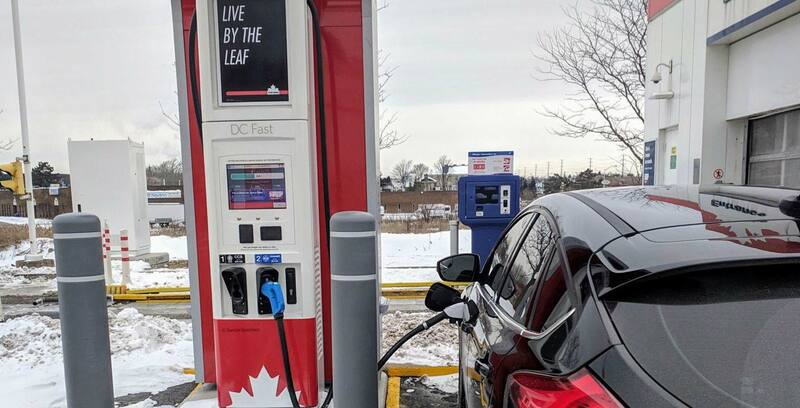 Petro-Canada has added a level-two electric vehicle (EV) charging station to its gas station on Steeles Avenue in Milton, Ontario. This is Petro-Canada’s first first-party branded EV charger. The station has two chargers, and each one can support two cars at once. Interesting to note about the chargers is that they output DC power up to 100 or 200 kW depending on the type of plug you use, according to Electrek. The 200 kW charger uses the combined charging system (CCS) charging standard. Since the charging station is so new, it’s likely using a second generation version of CCS, which would allow it to support 200 kW charges. The 100 kW outlet uses the CHAdeMO standard. While it’s still a fast charger, it can’t supply power as quickly as the 200 kW CCS plug. Since most EVs can’t even charge at these rates, it seems like the stations are future-proof. On the PlugShare page for the Petro-Canada charger, one user noted that the cables at the station are pretty short but still usable. The charger is currently free as the company is still testing out its infrastructure. There’s no mention as to when Petro-Canada will start charging for power. This is big news for Canadians since Canada’s EV charging infrastructure is lagging behind other developed nations.